Okey Ndibe was born in Eastern Nigeria in 1960. A novelist, political columnist and essayist, he moved to the United States in 1988 at Chinua Achebe’s invitation, helping to found African Commentary. 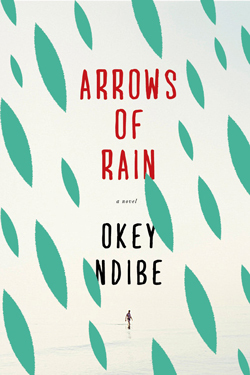 His critically-acclaimed first novel, Arrows of Rain was published by Heinemann in 2000 and his follow-up, Foreign Gods, Inc by Soho Press in 2014. Okey has earned both an MFA and PhD from the University of Massachusetts at Amherst and has taught at numerous universities around the world, including the University of Lagos, Trinity College and Bard College. He is currently Assistant Professor of Africana Studies at Brown University in the United States. 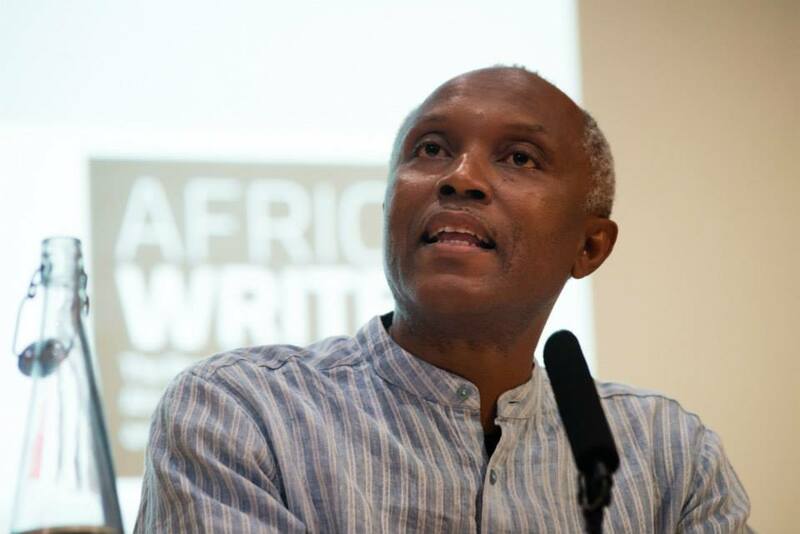 Okey was kind enough to speak with Africa in Words following his book launch during Africa Writes at the British Library in London on 13 July 2014. The following transcript has been lightly edited for coherence. MK: I wanted to start by asking you about your second novel Foreign Gods, Inc.. There has been quite a long gap between your first book, Arrows of Rain and this one. What was the experience of writing a second novel, as opposed to a first novel, like for you? ON: The process of writing this novel was very interesting, because I actually started writing Foreign Gods, Inc. soon after my first novel was published. The first novel did so well with Heinemann that they asked me to write the second novel as quickly as possible. I told them that I don’t actually write so quickly, but that I could write a series of short stories and so I began to write what I thought would be a short story called ‘Foreign Gods, Inc’ and other short stories. But sixty pages into this story I knew it was not going to be a short story. Then I thought that it might actually be a short short novel, so I called my publishers and said we’re in luck, we’re going to get a novel. It’s not going to be long at all. The novel turned out to be a thousand two hundred plus pages. It took so many years to write. At this point I knew that I had this monstrosity and I spent four years cutting it down to 506 pages. I then showed it to my agent and she suggested further cuts. And eventually, by the time the publisher accepted it was 346 or 47 pages. And of course the editor did some more cutting. So it was a different experience then, because the first novel came more or less around size. This one went from being what I thought would be very small to extremely massive and I had to spend quite a few years cutting it down. Hence, that hug gap between the novels. And at times I wanted to abandon it and do something else, but I was so taken with the story that I couldn’t put it down to write something else. MK: Yes, I remember you said in another interview that you just had to keep working on it so you could see how it ends! MK: Creatively, is there a difference when you’ve already had a novel come out? ON: I think for me the fact that I had a novel published already just meant a certain kind of confidence to take on what I imagined was a more complex tableau. It helped; it boosted my confidence that I had a book that was already published in the world and read by so many people. But there was also a measure of anxiety, you know. The first book had been universally loved – actually – there was one American woman who reviewed it and hated it – but, you know, near universal applause for the first novel. So even though I had confidence I also wanted to write a novel that would at least be equal to the first one. And the jury has been sort of equal – some people feel the first novel has an edge and some people, in the words of one American review, think the second one has blown the first out of the water. 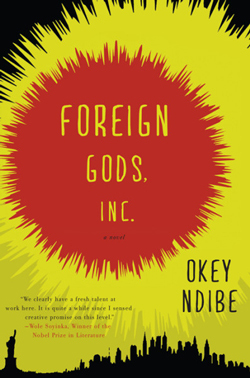 MK: Foreign Gods Inc, as a novel, is quite critical of just about everybody. You have some moments which are quite critical of America, of the way immigrants are received in America. It’s also quite critical of the ways in which America exports its religions, its popular culture and its aspirational lifestyle, but you’re also very critical of Nigeria. The second Ike gets off the plane he’s just met with corruption after corruption after corruption. Have you received any criticism from either side about this? ON: Well, I have been scolded, actually. An American woman who reviewed the book for a blog said that this was a brilliant, original novel, that the characters were wonderfully achieved, the dramatic situation was very engaging, but she said that it was not realistic that the character would find himself in this situation in America. But on the whole I think that this is a novel that is admittedly dark, but then there is a lot of humour in it. Even Ike’s interactions with the people around him, with this crooked pastor, have moments of great humour in them. I’m attracted to stories like that, which can be bleak and dark, where therefore the moments of humour become essential to them. On the whole people have loved it, though. The important thing is the authenticity of the story. A blogger in America talked about encountering Teju Cole in Washington DC when he read there and asking a question about what he felt was a negative view that runs through the story [of Open City] and asked, if you had to do it again, would you change things around. Teju said, ‘look the question is not whether the story is dark or whether it is negative; it’s whether it’s true.’ And of course there are different versions of the truth, but a writer has the ability to explore these issues, these different directions. I tend to agree with that sentiment. MK: One of the characters I found quite interesting was Queen B and that relationship between Ike and Queen B. In the last ten years or so, there have been a large number of novels written by people from the African continent but set at least in part in America, which deal with the often-troubled relationship between Africans and African-Americans. How did you feel about that when you were writing the novel, especially as an African in America? ON: I have to say that in my mind, on some level I see Africans and African Americans as one people really, but these people have been cut apart from that by history and other forces. When Africans come to America one of the things that they are told quickly is that you guys work hard, unlike these African-Americans who don’t want to work hard, who don’t want to seize the opportunities. Some Africans believe that narrative, and I tell them that we haven’t had the experience of suffering and subjection, the horrific destruction of infrastructure that African-Americans have faced. When I arrived in America I arrived with a certain kind of comfort which, if I had grown up in America, maybe I wouldn’t have. Having said that, there’s also some African-Americans who find the African presence uncomfortable, which is a shame. I’m troubled by that difficult relationship and I wanted to bring it to the fore of the novel. The thing is, Ike’s problem isn’t that he married an African-American woman. Ike’s problem is that he married somebody who is not from his social and intellectual class. He could have married a different woman, but he left that relationship on account of the flak from her father. Interestingly, a young African-American woman read the book and then called her father upset at what she said was my negative portrayal of African-Americans. But I say to that, no, I wasn’t portraying all African-Americans. I was portraying one character. Just like when Ike goes to steal the god, I’m not portraying all Africans as people who steal gods. Overall, though, it’s a difficult situation and I wanted to portray that in my novel. MK: Another theme in the novel is the idea of return, Ike’s return to Nigeria after a long period of absence, which is another trope that we see a lot in African writing from the last few years, such as Adichie’s Americanah or Cole’s Every Day is For the Thief. What do you think it is about the novel of return that is making it such a pressing issue for African literature now? ON: I think it speaks to our experience. In a lot of ways, literature is a mirror of experience, of life. I think that from the 90s there has been a slow interest by a lot of African immigrants either from the UK, Europe or America to explore the prospect of a return to their roots. But of course they have changed. When they return they find that sometimes their values have become inimical to their dreams and to their imagination of how to carry on their lives. Adaptation is always ongoing and you suddenly feel like you have lived in America for so many years without ever really feeling American, and then you return to the place that you have left, your native place, and you find that in a lot of ways you’ve become a stranger there as well. So that particular experience of… of feeling estranged from different places at once lends itself to great fictive and literary exploration. MK: And it isn’t just the person that changes, right? In the novel, there’s that great moment where Ike’s driving through town and doesn’t recognize anything. ON: Precisely. Everything is subjective, because suddenly great changes occur. So Ike goes to his uncle’s shrine and his uncle has a cell phone, in fact two cell phones. And Ike doesn’t like to use a cell phone in America, yet suddenly he sees his uncle in his shrine, in the middle of a prayer, and his phone rings and he shouts hello. That sort of thing. He sees a bridge over the river which was brought by a politician who had a lover from the village and so there is a lot of transformation. And there is the transformation of the spirit of the community; so people can send texts, you have Facebook, you have the internet. It’s a huge quantity of change and yet in a lot of ways there are things that are so contrary to the modernist impulse which we also encounter in the village. MK: In the novel, one of the big agents of change is America, that American influence, whether it is through evangelical religion or that amazing scene where Ike sees the kids watching basketball. But it’s not new basketball, it’s a twenty year old video. So what do you make of that seemingly intractable forward march of American influence in all of these different spheres of life? ON: Well it used to be, which is part of what I’m exploring in the book, that when I was young and growing up in Nigeria the land of the white man was England. That was it. And so, I would not have dreamt twenty five years ago of sitting down to watch a basketball game. Then I went back to Nigeria several years after I went to America and people were asking me about Michael Jordan. There was an interest because people were just astonished that these athletes who just threw balls through a hole could make so many millions of dollars, more than most football players. And the thing about America is that it brings so much money in, and then you have its sheer size, its sheer power in the world, all of which create this fascination with America that I have found to be deepening in Nigeria. And as you rightly point out, it is also through the evangelical movement. Everywhere you look there are signs for churches. It’s become comical almost. And the spelling! Like you might see a sign say ‘mighty’ but spell it ‘mity’, you know. There is that great fascination with America and that has come with an entire accoutrement of American things. When I taught as a Fulbright scholar at the University of Lagos, a student of mine walked up to me and said, ‘Prof, what is cooking man’, sort of just speaking the way that he imagined Americans speak. I told him it was okra stew that was cooking. So my novel is partly about the way that we consume one another’s illusions. Here are people watching this very old American game and just fascinated by the idea that these people get paid millions, bags of money. They are consuming in their minds, they are imagining that they want to start eating like Americans. They want to give up their local cuisine and start eating pizzas and hamburgers and drinking Coke, because this is the way they feel Americans eat and drink and so on. And of course, in New York and in London and elsewhere wealthy people have now developed a taste for African… what we might call exotic deities. In both cases we see the ways in which we consume one another’s illusions. There’s a trafficking in images. In the case of the kids, the men and women in the village, it’s that they are really consuming the crumbs of the politicians who have stolen their resources and who have transferred them abroad. The crumbs are what they are given. MK: So do you think that the fact that people have been sold these images is why they keep putting up with it? ON: I think it has a lot to do with it. The images are very strong. I’ll tell you a story, talking about the power of America. I was in Japan in 1993 as a guest of the Japanese Government. I came into my hotel room and turned on the television and the show was in Japanese. But they kept showing images of Michael Jordan soaring through the air, dunking the ball. Then they’d pan to the streets and show all of these images of people crying: men, women, children, just weeping. And the commentator was running these comments. Since I didn’t speak Japanese, I imagined, I conjectured, that Michael Jordan must have died, that was why they were crying. I quickly went to CNN to find that Michael Jordan had just announced his retirement for the first time from basketball, and his fans in Tokyo in Japan were crying. That gave me a new insight into the power of American culture – the depth and reach of America’s cultural power. Michael Jordan and people like OJ Simpson were given passports to cross this line and become basically non-raced, un-raced, as it were. They were no longer black, even though Michael Jordan’s skin is extremely black. They just became someone we could all be like, if we just drank Gatorade or wore Nike shoes, then we could all be like him. So those images are projected into Africa in a context of great poverty and they have a quick, penetrating impact. MK: Much has been made in the last eight or nine years about this idea of a renaissance of African literature, especially Nigeria, the idea of new Nigerian writing. Now I know that you’ve been working in the area since the 80s or before so I was wondering whether you think it is true? Is there a new Nigerian writing or is it just that we’re taking notice of it, in the West, in a different way now? ON: I think that it is just that we’re taking notice of it in the West now. I get asked this question a lot in America, of why it is that African writing is suddenly important. And I say that people have always been writing, but publishers in the capitals in New York, London and Paris are only now taking notice. It’s part of the logic of the marketplace. You could give them a gem and they will ignore it until somebody gambles on one and it works. And then suddenly they are all asking if you know any African writers, to bring them their way. And then because there are always gifted African writers, suddenly you find a profusion of African writing. When I finished Arrows of Rain I sent it to an agent. Actually, first I sent it to American publishers and some of them never responded. Others praised the manuscript but said it was not for them. Then I found an agent and she sent it to five publishers. Out of the five, three wrote to say they were not interested. One wrote back and said this novel is amazing but I don’t think there is a readership for an African writer’s novel. And then one editor at a press said that she loved it, but wanted more time to have two other editors read it. At that time Heinemann had offered me a contract and they wanted me to sign quickly. My agent wanted to risk it and wait, but I said ‘Look one or two of the editors could read it and say the same thing: that Americans may not be ready for an African novel. I’ll go with Heinemann, who wants my novel.’ And now my current publishers have bought the rights so an American edition will be released, it will be re-released in January. They are very excited about it. They are really doing a lot of marketing for it because they think it will have a huge market. And all of the professors I have heard of who have used it in the classroom have had a great experience. One professor told me that he asked his students to read half of it for the first class and every single one of them walked in and said that they couldn’t stop so they read the whole thing. Yet, twelve or thirteen years ago when I was selling it American publishers were not ready. Major publishers in the UK were not ready. Suddenly, now they are ready. MK: As you know, Africa in Words, for whom this interview is taking place, is a blog started by PhD students. You yourself are a professor at Brown University, so it felt appropriate for my last question to ask you what you think is the future of scholarship on African writing? Has it kept up with the inventiveness of the writing? ON: I want to see scholarship catch up. I think that there is so much important work coming out but I don’t think there has been an adequate level of critical engagement with that work. But I’m hopeful because there are so many great young scholars and students who are engaging with the work, with the important tropes. I’d like to see African scholars and readers engage more with the work, as well. It’s a pity that one has to come to London to find this kind of audience. I’m lucky that when I go to Nigeria that I get huge turnouts, but it is largely because of my political column. People want to see the trouble maker. I’d like to see more of a vibrant reading culture emerge in Nigeria and other African cultures and for structures of publishing, too, so that we are telling the world from Nairobi or Lagos or Dakar what is important, rather than always having the validation come from the West. 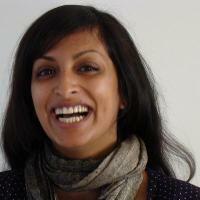 Madhu Krishnan is a Lecturer (Assistant Professor) in 20th and 21st Century Postcolonial Writing at the University of Bristol. Her research considers the construction and dissemination of an idea of Africa in contemporary African writing, interrogating the contours of representation in the creation of ‘global’ and ‘local’ African literatures. She has published numerous articles on African literatures and postcolonial studies in journals including Research in African Literatures, Textual Practice and The Journal of Commonwealth Literature. Her monograph, Contemporary African Literature: Global Locations, Postcolonial Identifications, was published by Palgrave Macmillan in 2014. Thank you for this fascinating interview. I know Okey and admire his novel, Foreign Gods, Inc. Now I’ll read the earlier novel too. Maye I can recommend it to a couple of book groups I belong to. I love this interview. I loved reading Foreign Gods and my dad just read it too and has a lot of praises for it because we had same experience in my community. Around the 90s some youths formed a gang of robbers and stole all our deities and masquerades. Most of them were cursed by the community and they are useless today – dead, some mad, some are loafers. Thanks Okey for bringing this to the fore.